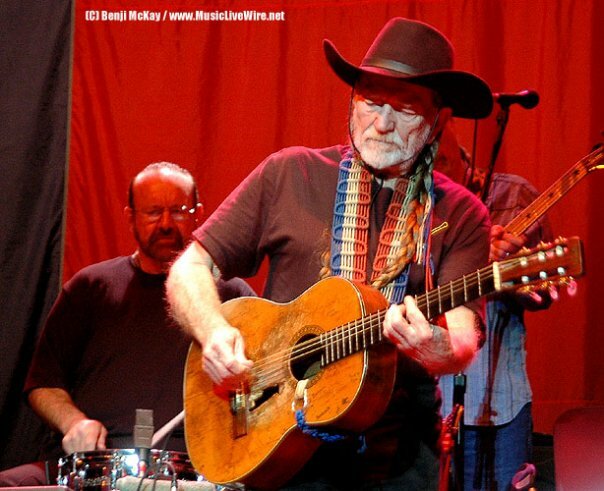 Willie Nelson is an American institution. With his relentless touring schedule, he’s one of the hardest working musicians out there. However, when he’s on stage, it looks like there’s no place he’d rather be. He treated the sold out Columbia crowd to a night that had everyone in the crowd moving together. From 14 year old kids to 80 year old ladies, everyone was dancing in the aisle. The rednecks mingled with the trendy hipsters. Nelson is proof positive that music is the great leveler. While the show was decidedly shorter than previous ones, Nelson looked more focused than ever before. He let loose and jammed more often too. His peculiar playing style delighted the crowd and cemented his position as one of the great guitarists. He opened with his trademark “Whiskey River” before going into the progressive “Still is Still Moving To Me,” totally abandoning his perennial second track “Stay a Little Longer.” He then tore through a version of “Beer For My Horses” that was actually good. He hit all the crowd favorites including “Mammas Don’t Let Your Babies Grow Up To Be Cowboys,” “On The Road Again,” “Blue Eyes Crying in the Rain” and “Always on My Mind.” He also performed the new track “You Don’t Know Me.” He then stated that he “just wrote a new song” before launching into the hilarious “I Ain’t Superman” which stood up to the best of his hits. It’s good to see that Nelson’s songwriting chops and since of humor remain in tact. Following this, the band once again started their finale vamp and Nelson once again unstrapped his guitar. He then turned around, stopped the band and strapped back up. He went through “The Harder They Come” and “In My Sweet Baby’s Arms” before finally saying good bye for real. The crowd gave him a long standing ovation and the house lights came up. Everyone in the crowd had throughly been satiated. Willie Nelson is like your grand dad who knows how to have fun. He’s easily relatable and totally sinciere. If this sold out Columbia audience is any indication, we’ll see Nelson and Family again next year.